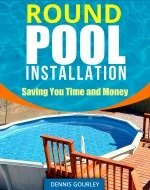 We are installing a 24 foot round above ground pool in our yard. Everything is level and we have followed directions to a T. We screwed the metal lining closed and although it still falls perfectly on the cement block, the row of nuts and bolts is about an inch off center on the plate. Do we need to take it apart and start over? The problem is that there are only 2 of us to manipulate the heavy metal. Hi Karen Where the bolts rest on the plate is not important. The idea with putting the wall seam behind an upright is just to hide it, that's all. If your upright covers the seam that's all that matters. If the seam has shifted and is in the way of the upright you may want to consider doing the wall again. Another consideration with the wall seam is what you had to do to get it to line up. If you were an inch from meeting and you made all that up on a single bottom rail plate then your pool is no longer level. It is very common to get around to the end and see that you need to adjust one way of the other. I always back the wall out for several rails and make the adjustments a little at each footplate. The difference I have to make up depends on how far back the wall goes. Several inches means I got the rail gap all wrong and I would be starting over. A half inch is pretty normal, back the wall up 12' and adjust a few footplates, then all is good.